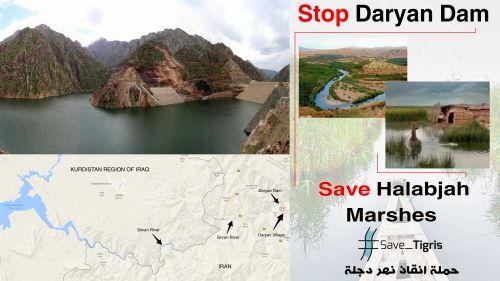 The Save the Tigris and Iraqi Marshes Campaign have released a report on the impact of the Daryan Dam on the Kurdistan Region of Iraq. The Daryan Dam is a large dam currently under construction on the Sirwan River in Iran. The report highlights the controversial construction of dams for purposes of self-interest in a water scarce region despite evidence of their significant negative impact both locally, through displacement, and downstream, through reduced water flows. To date, there is very little literature available on the Daryan Dam, even though its impact on Iraq is huge. The report aims to fill that gap by presenting a social and political analysis of the impact of the Daryan Dam on the Kurdistan Region of Iraq. The report is primarily based on qualitative research carried out through interviews with KRG officials, local officials of affected areas, NGOs and academic experts. The publication is presented at the Norwegian Social Forum in Oslo, during a seminar on water crises caused by large dams, attended by representatives from FIVAS and the Norwegian Ministry of Foreign Affairs. Between 20 to 30 percent of the Tigris River’s annual flow originates in Iran via the Sirwan River and the Alwand River. In recent years, Iranian water projects have greatly reduced water flows of the Alwand River, and the construction of the Daryan Dam located on the Sirwan River in Kermanshah Province of Iran will significantly affect water flows to Halabjah Governorate in the Kurdistan Region of Iraq. The Daryan Dam, which is expected to be completed in 2018, is predicted to reduce the water flows of the Sirwan River by up to 60 percent, which will affect hundreds of thousands of people in the Sulaymaniyah and Halabjah Governorates. Diminishing flows of rivers will cause a drinking water crisis and will heavily effect the agricultural, hydroelectric power and fishing sectors in the Kurdistan Region. The reduced water flows of the Sirwan River, known as the Diyala River in Iraq, will also have significant negative impacts on people and communities further downstream in Central and Southern Iraq. Water scarcity, which is expected to worsen in the coming decades with the continued onset of climate change, will have severe negative consequences on food security, livelihoods, health, the environment and industrial and economic development in the whole of Iraq. The Save the Tigris and Iraqi Marshes Campaign believe water is a resource that does not belong to any particular state, nation or sect. Water should not be used as a political weapon, and water scarcity need not be a cause of conflict. Rather, water can be used as a tool for sustainability, cooperation and coexistence between the Kurdistan Region of Iraq and its riparian neighbors. Since 2012, the Save the Tigris and Iraqi Marshes Campaign has been advocating against the construction of Ilisu, Daryan and other large dams to preserve the cultural and environmental heritage of the Tigris River, and for the sustainable and equitable use of water for all. Save the Tigris Campaign © 2018 / All rights reserved.